Rent A Casino wants your event to be successful! If your party isn’t a success, our company can’t succeed. Rent A Casino likes to encourage our customers to ask us as many questions as needed to ensure this success. You can hire a professional party planner to handle these details, but it isn’t always necessary. With our experience in the hospitality and entertainment business, we can answer any question you have or at least point you in the right direction. The following questions need to be answered before any vendor can give you a quote. A successful casino party will allow at least 80% of the guest to play at once. You probably don’t want to under order. You will see mobs of people around each table. People will be annoyed that they can’t play the game they want to play, when they want to play it. On the other hand, you don’t want to see too may empty tables either. Let’s work together and plan the perfect event. We will work within you budget to make sure all your guest are happy. You may have your heart set on a certain function hall, caterer, entertainer, or event service. They may be booked already. Some vendors have seasonal rates. I must warn you, until you get the contract/deposit in a vendor’s hand. You can expect some fluctuation in rates and available service/products. The function hall that you book for your event may or may not have the square footage for casino party equipment. In our suggested packages section on our web site, we give you the square footage needed for each package. Honestly, you might want us to come out to the facility to help with the floor plan. We don’t want to see your party ruined, due to lack of planning. Please let us help! It is not necessary to offer a full lunch or dinner at your event, but whenever you put together a group of people for three or four hours you will need to make some provision for refreshments or finger-food. We have a close relationship with Boston’s finest caterers and can recommend the right cater with the right menu for your theme. Most hotels and country clubs have their own catering dept. So if you book in one of these venues you will have to pick from their menu. Rent A Casino offers some décor to accompany our premium casino grade tables. We can certainly tell you where to get decorations if you don’t know. If your budget allows it, we can actually go out and purchase or build life-size décor for your event. Nobody will know about your event if you don’t promote it. You may have to remind people three times about your event. Tell them six weeks in advance, two weeks, and the week of the event. Put them all on an E-mail list if you can. Casino parties are for entertainment only, but you should offer some type of reward for winning the most chips. We suggest gift certificates as prizes instead of cash. 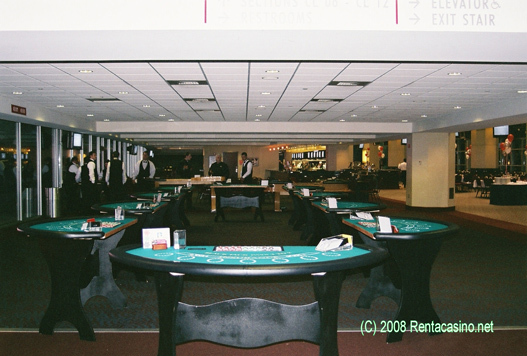 Rent A Casino will work with you to create a custom package that all of your guests will enjoy. That’s our job! You should ask some of the attendees what games they like. You don’t want to order 4 craps tables and nothing else. Use our suggested packages to help you through this process. Most casino parties run between the hours of 7PM to 11PM. This is plenty of time to have a party. Rent A Casino offers premium DJ services for our events. Typically, you don’t want music pounding in the background while guests are enjoying the games, but background music is nice to have and of course you’ll need a PA system to make announcements. We also work with other entertainers as well. Let us know what you need! Rent A Casino will clean up after ourselves. You are in charge of cleaning up after your guests. In some cases you will have to hire a clean-up crew if the venue doesn’t have their own. Did we leave anything out? If you have any questions that are not listed here, feel free to ask. We want to make you a guest at your own event. Call today and we’ll guide you through the process of creating the most fabulous casino party ever!